Pumpkin pie has been typecast. It always plays the same role: The Thanksgiving Day Dessert. This is unfortunate because pumpkin pie has great range and versatility. In addition to being a great lead, it's a talented supporting player too. Think of the possibilities: pumpkin pie muffins, pumpkin pie cheesecake, and my favorite, pumpkin pie pudding. Every year, weeks before Thanksgiving, I would anticipate my mom's pumpkin pie: a light, flaky crust filled with sweet, custardy, walnut studded, spiced pumpkin. The only thing better than a slice of her pie on Thanksgiving Day with a dollop of whipped cream was a slice of her pie the next morning for breakfast. To me, nothing beats chilled pumpkin pie. So it wasn't unusual when one fall day a couple of years ago, I had a serious hankering for my mom's pumpkin pie that couldn't be satisfied. Sure, I could have called her for the recipe, but it never would have tasted as good, and buying one was out of the question. I reluctantly decided to make vanilla pudding with pumpkin pie spice instead. It was so good that the next time I made it, I added canned pumpkin and nuts. After several more experiments and many happy mouthfuls later, I present Pumpkin Pie Pudding with Candied Pecans and Whipped Cream. This pumpkin pie pudding is ideal for those of you who don't have the time or the desire to make pumpkin pie from scratch. It's a deliciously fast, easy, and satisfying fall and winter dessert that can be whipped up in no time. I find pumpkin pie spice (a mixture of allspice, cinnamon, ginger, and nutmeg) is the easiest and surest way to season the pudding, but feel free to experiment with any spices that suit your taste. If you really need something crust-like, then make a quick mixture of spice-laced toasted oats, nuts, and brown sugar to sprinkle on top. Of course, you could still have traditional pumpkin pie on Thanksgiving Day. But if you can't wait until then, make yourself a batch of this rich and creamy pumpkin pie pudding. You won't be disappointed. Combine sugar and cornstarch in a medium pot over medium heat. Add 1 cup of milk, whisking until the sugar and cornstarch are dissolved. Add the second cup of milk and salt, and bring to a simmer, stirring frequently. Lower the heat, cooking pudding for 10 minutes, stirring frequently. Remove pudding from heat for 2-3 minutes. Lightly whisk one egg with vanilla extract; slowly add to the pudding, whisking constantly. (Removing it from the heat will prevent the egg from cooking). Stir in the pumpkin and pumpkin spice. Simmer for 2-3 minutes, or until thick, stirring several times. Remove from heat and place in serving dishes. Before you make the candied pecans, lay a piece of tin foil coated with cooking spray on the counter. Also coat your utensil with cooking spray so the sugar won't stick to it. In a medium non-stick skillet over medium heat, add the pecan halves. Sprinkle sugar and salt evenly over them. As the sugar begins to melt and coat the pecans, quickly stir them until evenly coated and lightly toasted, about 1-2 minutes. Remove from heat and slide nuts onto the tin foil, including any sugar drippings. (Avoid browning the nuts as the sugar will taste burnt.) Let cool and harden, then chop into small pieces. Before you begin to make the whipped cream, consider these helpful tips: Start with a deep stainless steel bowl that has been chilled in the freezer for about 15-20 minutes. Chill the beaters of the electric mixer as well. Both will help to create more volume in the cream. Once ready beat ½ cup heavy whipping cream on medium-high speed until soft peaks form. Sprinkle sugar evenly over the whipped cream and beat until peaks re-form. Whipped cream can be covered with Saran Wrap and refrigerated for 1-2 hours. Yes, Yes, Yes! The crust is my least favorite part of just about any pie. I am endlessly impressed that you have enough candied pecans after the nibbling to be able to put any on this lovely dish. And yes, I sure do agree, you get right to the good stuff of the pumpkin pie in this dish! I'm not crazy about pumpkin, so I always keep a can of squash in my pantry to substitute in recipes like pumpkin pie. They taste so similar, and I think it would work well in this pudding recipe, too. This is perfect! I never eat the crust anyway. yum!! this looks soo good!! i love anything pumpkin flavored!! and i love pecans :) pumpkin pie is one of those dishes that makes me really nostalgic, too. it just feels like home. That pudding looks incredibly good! Anything pumpkin Pieish has my approval ;-P! Yummy! Pumpkin pie PUDDING! Of all the myriad manifestations of pumpkin pie baked goods floating around this time of the year, this is one I haven't seen. Brava! What a lovely recipe for Thanksgiving. I liked the idea of caramelizing the pecans. Sounds delicious.......perfect for this time of year. I generally love pumpkin but not pumpkin pie, so this looks like a nice alternative! OH. MY GOD. that looks gorgeous. I can't get enough pumpkin right now:) I've got to make this!! When my mom makes her pumpkin pie, she always has a small ramikin leftover that she cooks. I've always loved that! My roommate and I were craving something pumpkiny yesterday, so we went all out and made a pie - and had some more for breakfast this morning! It was delicious, but also a lot of work (with a made-from-scratch crust) - next time the craving hits, I'll keep this pudding recipe in mind. Wow, pumpkin pie with no worries about a gluten-containing crust! Yippee! Pumpkin pie is the only thing that keeps me from being completely depressed when the weather starts to get chilly! I'm not a big pumpkin pie fan, so this is a great and delicious sounding alternative! Sounds wonderful! I pour my usual pumpkin pie filling in lightly-greased custard cups, and bake them in a water bath for 20-25 minutes at 350 degrees. Your candied pecans would make this a special treat for my family. Thanks for the tip. Um, I love the concept, but I ran a search in the article, just to avoid being a total idiot, and it seems that the pumpkin and the spice never make it into the pudding, am I wrong? Oh, fine - I'll have to kill whoever wrote the FIND on my browser - of course the pumpkin and spice made it into the recipe. Never mine. Ugh. I love everything pumpkin, but I've never thought of doing pumpkin pie pudding! Sounds delicious! I'm not used to eating pumpkin in sweets - not many of us here are, actually - and have never tried pumpkin pie. This looks like something I'd love and ask for seconds, Susan. Great recipe, and I agree pumpkin pie is capable of being so much more than pumpkin pie. Try these pumpkin pie cookies! Hi - do you think this would work with apple puree too? I bet the pudding is fabulous!! This looked so good Susan that I had to make it right after I saw this. Can't wait to taste it!!! tanna-Then this is for you. lydia-My mom makes squash pie too, which I love. susan-I hardly ever do either. 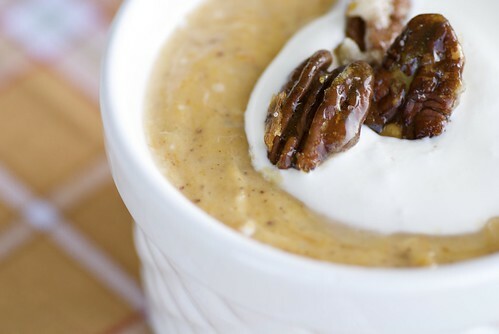 heather-Aren't pumpkin and pecans fabulous together? ivy-Caramelizing is the fun part too. joanna-Hats off to you though for all that hard work! gffg-Yay! I'm so happy to hear it! frantzie-Mmm... pumpkin pie custard. I'll have to try that too! Thanks for the idea. deborah-Hope you give it a try. patricia-I wish you could try my mom's pumpkin pie this Thanksgiving. hillary-I recently made pumpkin spice cookies. I love them! anonymous-I've never actually done it before, but I don't see why not. Just be sure that it's thick, like the pumpkin puree. That may mean adding more cornstarch. You just don't want it thin like apple sauce. Let me know if you do it and it works out! Now this looks different and good! Love pumpkin. I wonder, do you know anything about using pumpkins from pumpkin patches in recipes? I know that they can be quite watery, but I want to see if I can use the ones on my porch this year instead of tossing them out. I was thinking of baking and then straining them, do you think that would work for a recipe such as your pumpkin pudding? I have had a pumpkin custard recipe for a long time that I really love to make. I am going to try this with soy milk - that sounds easy and delicious. Susan, You're brilliant! I would never even miss the crust with this! All you have to say is Candied Pecans and I am there! Love this twist on a classic! gudren-I think you could use fresh pumpkin, but as I suggested to someone else who emailed me the same question, my main concern is it being too watery. Roasting the pumpkin may help. Also, you may have to use more cornstarch as a thickening agent. I haven't used fresh pumpkin myself. So, please, let me know if it works out. tw-Mmm... how about I try some of your pumpkin custard? oh my goodness -- i haven't been to your blog in a while and everything looks amazing! the smoothie looks delicious, this looks like such an awesome new pumpkin recipe, and dorito-like mac and cheese?!? are you kidding me?!? I would eat pumpkin pie EVERY DAY. Thanks. I have 100 pounds of heirloom pumpkin waiting to be cooked. The recipe looks a lot simpler than I expected. I will definitely be trying this! I would love to eat this, those candied pecans are perfect! I will definitely be trying this recipe either this weekend or next weekend because my fiance LOVES anything with pumpkin in it. This sounds awesome! katy-Pudding is such a fun food. nic-I could eat just the pecans! justin-I hopes she enjoys it then! Mmmmm, pumpkin pie ANYTHING!! I'll let you into a little secret - I made pumpkin pie muffins (well, with butternutm that is!) for my WTSIM entry, to be posted soon and they were glorious! I am also slightly addicted to (evil, evil) Starbucks' pumpkin pie spice latte. I feel so dirty after I've had one... but so satisfied. Call me shallow!! The Boere way of preparing pumpkin is to load it with butter and sugar and serve it with meat. One thing I haven't gotten my head around yet is serving pumpkin for pudding, which I really should give a go sometime, because your dessert looks delicious.